Why is it so easy to find sugary cereals and dinosaur-shaped chicken nuggets in a grocery store, but so hard to shop for nutritious, simple food for our children? If you’ve ever wondered this, you’re not alone. But it might surprise you to learn that this isn’t just an American problem. Packaged snacks and junk foods are displacing natural, home-cooked meals throughout the world-even in Italy, a place we tend to associate with a healthy Mediterranean diet. 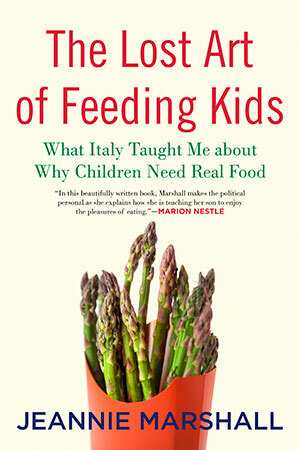 Italian children traditionally sat at the table with the adults and ate everything from anchovies to artichokes. Parents passed a love of seasonal, regional foods down to their children, and this generational appreciation of good food turned Italy into the world culinary capital we’ve come to know today. The Taste of Soup Of all the things I ate during my first year in Italy--like the grilled whole fish with the crackling skin and a green salad by the seaside, the handmade fettuccine with earthy-smelling black Umbrian truffles shaved on top, and the slice of crisp pizza topped with buffalo mozzarella, ripe tomatoes, and basil--it was a bowl of soup that really linked my present food-filled Italian life with my small-town Ontario childhood. In the winter of our first year here, we went to Tuscany for the weekend with some friends. We all stayed together in an old stone house in the Val d’Orcia. It was early December and it was cold. The wind whipped through the valley below the old house and sent gusts of chilled air through the cracks around the windows. We decided to seek warmth and dinner in the nearby village of San Quirico. The six of us bustled into a restaurant and asked for a table near the open fire. We soon thawed out, thanks to the fire, a bottle of red wine from nearby Montepulciano, and a basket of bread. At the urging of Giuseppe, one of our friends at the table, we ordered a farro dish to start. Farro is a grain that tastes rather like barley but is denser. It had been cooked slowly in a broth the way you make risotto and was served with mushrooms and Parmesan cheese. We ate it while someone cooked our meat--small pieces of pork and lamb--over the fire beside our table. When the meat was done, it was served to us with rosemary-scented roasted potatoes and big plates of leafy green vegetables that had been cooked in salted water, then drained and squeezed, and cooked again in a pan with olive oil, garlic, a few chilies, and a sprinkling of salt. It was simple, well-prepared, comforting food. It was the next afternoon at lunch that I ordered the soup. I had to be convinced to order it because I thought I didn’t like soup. It was a ribollita, which simply means “reboiled,” with white beans and barley cooked with a little bit of guanciale (pork cheeks), tomato, and dark-green cavolo nero. There was so little liquid that it was more of a stew than a soup, but it reminded me quite forcefully of food from my childhood. Maybe it took nearly a year to make this connection because my palate needed that time to recover from the barrage of flavors that I frequently ate in Canada (and missed, I must admit): the spicy Asian foods, the hot wasabi with sushi, and likely the ramped-up artificial flavors in the processed foods I wasn’t even entirely aware I was eating, things like crackers with rosemary flavoring, bottled spicy Szechuan peanut sauce, flavored yogurt, industrial bread, and adulterated bagels. Well, here I was, sitting in a restaurant in the heart of Tuscany, eating soup that reminded me of the soup my mother made in Jackson’s Point, Ontario, in the late 1960s. Hers was influenced by the soup her French-Canadian mother made for her family in Toronto in the 1930s, and the soup her French-Canadian grandmother had made for her fur-trapping family in Northern Ontario at the end of the nineteenth century. Of course, the soup I was enjoying in Tuscany tasted of hearty cavolo nero, which is that long, rippling Tuscan kale, olive oil, and Parmesan, while my mother’s tasted of her own chopped, preserved tomatoes, barley, beans, cabbage, and, most likely, bacon or lard. Both soups were thick, with a slightly meaty-tasting stock and with beans and grains that absorbed the liquid and most of the flavor. My mother’s soup sat on the back of the stove simmering away (an accidental ribollita). We would eat some and let the rest keep simmering. There was always a pot on the go; in fact, it seemed that everyone had such a pot in those small towns, because I can remember eating chicken soup at a friend’s house. Her mother was famous, not least among children, for her rich, savory soup, which was thick with some kind of grain and carrots. In the intervening thirty-odd years, I had forgotten all about soup. We moved to Toronto in the early 1970s, and we started to eat differently. Canned soup came into the house more often. It was such a time saver for my busy mother, who was raising a family on her own (my father died when I was a baby). Why would you spend hours simmering soup when you could simply open a can, heat, and eat something that, well, maybe it didn’t taste as good, but didn’t really taste bad? Why would you go to the trouble? With the exception of turkey soup, which my mother made with the remains of the Thanksgiving and Christmas birds, she rarely made soup anymore. And I guess that’s why I stopped eating it and somewhat unconsciously avoided it on menus. The Change in North American Food But really, how could the foods of Italy evoke my childhood meals in a small Ontario town? It’s the authenticity of very simple, well-prepared food, I suppose, that links these two disparate culinary worlds. Canadians and Americans have rarely thought of our countries’ culinary past in the way you might think of the food history of Italy. The food in Canada and the United States was heavily influenced by the foods of their diverse populations and then by big industrial producers of fast and processed foods. Before the processed foods though, before industrial farming and the food industry dominated food and eating, North American and European foods were more alike than different in a few fundamental ways. There was no chemical fertilizer or pesticides on North American farmlands when those areas were first being settled. There were no biotech foods, no chemical additives and preservatives. The food was grown and raised locally, and most of it was prepared and consumed at home. Culinary techniques and recipes brought from diverse parts of the world were handed down through families. The best of American and Canadian cuisine, which really is a fusion of various cooking styles with local foods, springs from this tradition. Some of it still exists, though it is no longer the norm. By the 1950s, the food industry was working hard to figure out how to convince American women to use packaged foods, to change their view of themselves as cooks, even to convince them that they didn’t have time to cook. The food historian Laura Shapiro says the industry manufactured a sense of panic about cooking, creating the idea that women neither enjoyed cooking nor had time for it. The fast-food industry pushed that even further by making fun, tasty food cheap and easily available in family-friendly environments. Canada had culinary traditions? I might have sneered at Gotlieb and thought her book an exercise in stretching a point, had it not been for my Proustian moment with the bean soup. But the soup brought back memories of the table set for dinner every night, of my older brothers coming home for Sunday dinner, and of the frosted, double-layer cakes that my mother made for those dinners every week. It wasn’t what we later came to call gourmet food, but it was built around hearty soups and stews, roasted meats and root vegetables, vegetables fresh or frozen in winter, and summer salads from the garden. In the 1960s, my busy mother used to bake bread two or three times a week. After we moved to the city in the 1970s, she rarely, if ever, made it. By 1970, only 15 percent of all flour sold in the United States was for home baking, while in 1900, it had been 95 percent. I assume a similar pattern existed in Canada, where the cult of convenience was so firmly taking hold. Why would a mother make her own bread when she could find it sliced, wrapped, and waiting in the supermarket? This was the beginning of the period when time spent in the kitchen was considered time wasted. Women wanting to liberate themselves from their domestic obligations, particularly in the kitchen, certainly played a role in this shift. My mother never called herself a feminist, but feminist ideas would have resonated with her. Betty Friedan’s The Feminine Mystique, published in 1963, describes the malaise of women who had to give up entirely on the idea of a family if they wanted a career, or who had to give up on a career or any sort of expression of their own individuality to serve their families. My mother actually liked to cook and she was a good cook, but like so many women of her generation with children, women who were working outside the home, or women like my mother who were trying to go to school while raising a family, she welcomed anything that could make her life easier. I remember that she made very simple meals for us, and that she involved her children in the cooking as we got older, but she also felt the pressure to take shortcuts. It was in the era of the working mother that packaged food really found its niche. What busy mother has time to coax her children to eat a dinner that she has carefully prepared from scratch? All she has to do is open a package and, considering the amount of salt and flavor enhancers that went into that package, children were sure to eat up. Packaged foods fit into the discourse of the day. They were convenient and they seemed nutritious, and that was almost all that mattered. Cookbooks from the 1960s and 1970s reflect both the excitement and the anxiety about these packaged foods. My mother’s very popular Better Homes and Gardens Casserole Cook Book (published in 1968) is all about opening cans and packages to make dinner for the family. Betty Crocker’s Picture Cook Book was produced by General Mills in 1950 and became a standard in American kitchens throughout that period. Recipes in magazines urged women to serve wedges of canned meat glazed with marmalade, and to broil sausages and serve them with canned peaches. In Canada, Madame Benoit, famous across the country in her day with her own TV show, published Madame Benoit Cooks at Home in 1978. At first glance, she seems to endorse authentic home cooking--she praises the superiority of beans baked in a clay pot overnight in a brick oven--but she also seems quite excited about the time-saving possibilities inherent in instant mashed potatoes, and includes canned beans and ketchup in a recipe for Bean Pot Pork Chops. For a while, Madame Benoit seemed poised somewhere between a Canadian version of Julia Child (she even trained at the Cordon Bleu in Paris) and Betty Crocker, but she eventually gave in entirely to the faster-is-better trend and wrote a book on microwave cooking. My mother had some of her books in our kitchen. Of course, not everyone was giving into convenience foods. In 1966, the popular Canadian historian Pierre Berton and his wife, Janet, published The Centennial Food Guide. They were clearly in the anxiety camp: “In a country that produces the world’s finest fresh meat, we submit to a dozen equivalents of Spam, all of them appalling,” they wrote with obvious disapproval. “We squirt fake whipped cream on our frozen strawberries and douse our instant pancakes with ersatz maple syrup.” The Bertons, who were clearly in the minority, feared that the way things were going, the art of cooking would soon become the art of stirring, and that babies would eventually be born without taste buds because they would no longer need them. The Bertons had seven children to feed, and the soup pot was always bubbling on the stove. What to eat was a constant question in their family, a constant source of pleasure. At least that’s how they presented it in print. In fact, the stories throughout the book are about cooking with their children, coming up with big feasts for the family, and sitting down to a good, cooked breakfast on the weekends. There are also stories about serving more elegant meals, though still composed of local ingredients, when the occasion called for it. There’s nothing about feeding children differently from adults, about hiding their vegetables in chocolate cake or cutting their sandwiches into the shape of a Venetian gondola. It’s probably safe to assume that the Berton household was free of specially prepared foods for children. In Britain, Elizabeth David brought life to stodgy English food after World War II with her Mediterranean recipes and books on French and Italian cooking. In the United States, Craig Claiborne was writing about food in the New York Times through the 1960s, bringing recipes and techniques from countries like Mexico and India, as well as Italy and France, to the page for his readers to try. (He is also known to have said, “I have learned that nothing can equal the universal appeal of the food of one’s childhood and early youth.” In his case, it was the foods of Mississippi and, in particular, his mother’s Chicken Spaghetti, a dish that combined chicken, ground beef, ground pork, tomatoes, cream, and many, many other ingredients, that he yearned for.) Claiborne is often credited, along with Julia Child, whose introduction to the world of French home cooking was published in 1961, with bringing a kind of artfulness to the kitchens and pleasure to the tables of America. Claiborne’s and Child’s influence, though profound, was nothing compared to the bulldozing influence of the food industries that were then gaining such a foothold. What these cookbooks of the 1950s and 1960s make clear, though, is that before the 1970s, people cooked real food. They might have been trying to recreate ethnic dishes from faraway places--and by that I mean Italian recipes in New York, French recipes in Quebec, and German recipes in Pennsylvania and southwestern Ontario--but they used the local, fresh ingredients they had at hand, and in the process they were creating something unique. Children Are the Gatekeepers I’ve been deliberately indulging in nostalgia with my memories of soup and homemade bread. Nostalgia has a bad reputation, especially in the ongoing debate about food. But nostalgia is important for reminding us of another time, when things were done differently; otherwise we accept our present state as completely normal. It reminds us that there may be something we’re missing. We can try to find the thread of traditions that ties us to our ancestors, that goes far beyond the people we actually remember. We can pick up those dropped threads before they disappear completely. Nostalgia can also remind us that the path we’re on now is not inevitable, and it is still possible to change course. Children are essential to this process. Children are the gatekeepers of culture; they hold the key to changing the culture for either good or bad. It’s up to the adults to include children in a culture of real food if the tradition is to be revived in North America or continued in Europe. The old ladies in my favorite Roman markets will soon be gone, and I often wonder who will be left to keep the pots simmering. Just as Proust’s madeleine opened his memory and released hundreds of pages of reminiscence (or as Remy’s ratatouille brought back happy memories of childhood to Anton Ego), a very happy period of my own childhood seemed to rise up along with the steam from a bowl of Tuscan bean soup. I remembered things I didn’t know I had forgotten. An image of the dining room of the house where we lived until I was nine years old came back to me, complete with its fussy, flowered chairs and curtains. I could see the beautiful table laden with food, and I remembered quite clearly what it was like to be the youngest child at the table with all my older siblings, listening to the unimaginably exciting tales of their lives, and realized how all of these experiences had a hand in shaping my adult life and personality. But what of children who won’t have such memories because they won’t have regularly enjoyed the pleasures of the communal or the family table? A family that sits around a table sharing the simplest of foods that someone has taken the time to cook will have memories that go beyond the food they actually consumed. Children who learn to read package instructions so they can microwave their own separate dinners might not be so fortunate. Living in Italy has allowed me to remember a part of my own history, almost to reexperience it. It’s also allowed me to see the schism that occurred, changing food for the worse and sending North Americans down an unhealthy path. It makes me fear for the future of Italy, as I see now what we lost and realize how easily we gave it all up, and how difficult it is to get it back. The Canadian and American slide into becoming fast-food, industrial food cultures was a gradual process. We didn’t change overnight. We adapted bit by bit, and we made use of the many time-saving products available to us. The industry capitalized on our apparent needs by offering solutions with ready-made meals that were fast (if speed was the issue), that were adapted for special diets (if losing weight was the problem) or were appealing to children (if picky eaters were the concern). The food industry seemed to have all the answers--answers to questions we didn’t know we were asking.